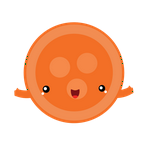 This article provides details on how you can change calendar views. It is possible to view the calendar by week, day, or staff. 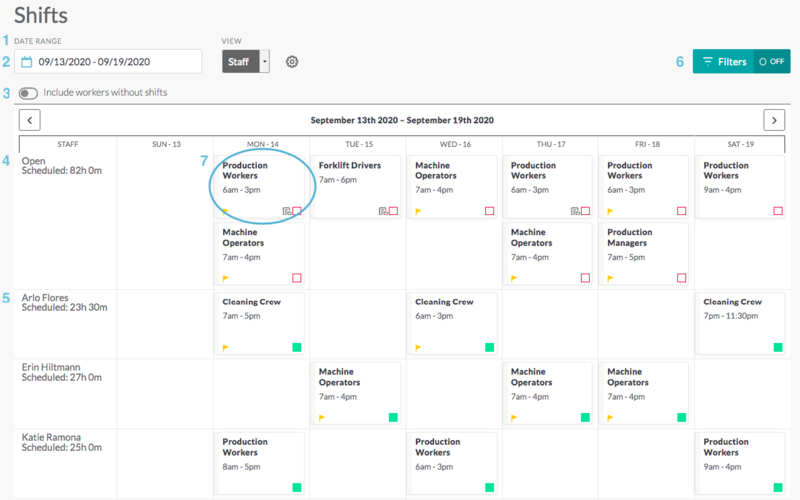 The week view can be customized for an organization, and may display additional information not shown in the example calendar above. The day view contains more information on screen than the week view, but shows only one day at a time. The staff view shows shifts for one week arranged by person. Once in the calendar, you can change the week start day. 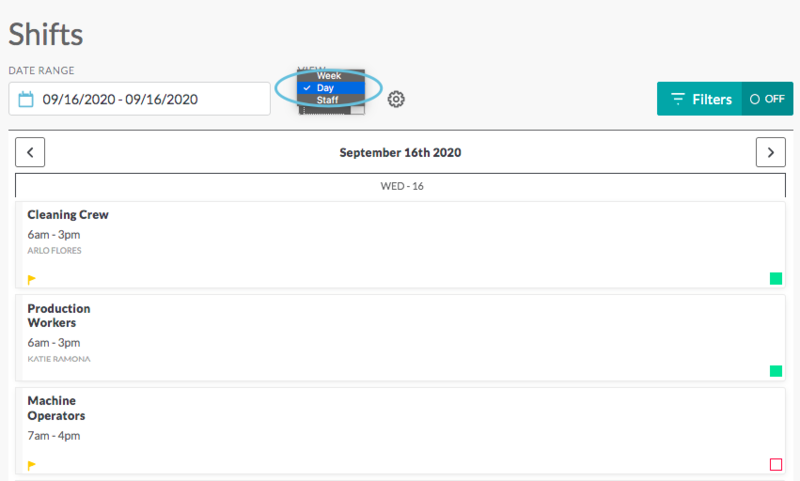 Click in the Date Range field to open the datepicker, then choose any date from within the calendar. The week-view calendar will automatically display the day and date you choose as the beginning of your week. Use the arrows on the far left and right to scroll backward and forward in one-week increments. 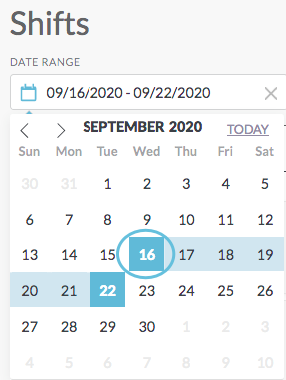 Date range—Use the datepicker to change the dates displayed on the calendar. View—Allows you to change between week, day, and staff views. Include members without shifts—Filters the list to show or hide people who are not scheduled for shifts. 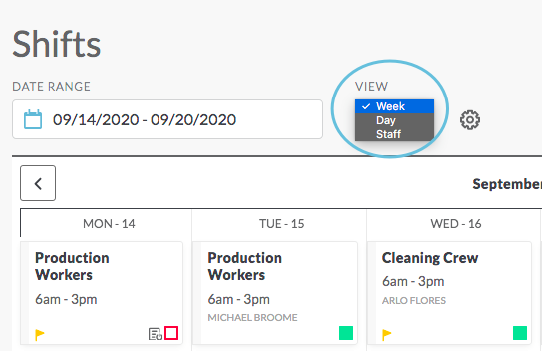 Click to move the toggle to the right (green) to display everyone on your team, including those who are not scheduled to work. Click to move the toggle to the left (gray) to display only people who are assigned to shifts. Open shifts—Displays all open shifts for the week at the top of the page. Name/Hours scheduled—Displays the team member’s name and cumulative hours the person is assigned to work for the week. Filters—Opens to select additional filters to see results by workgroup (teams), location, keyword, and other parameters. See Viewing the Calendar—Filters. Shifts—Click on the shift to view the shift details, edit the shift, or reassign the shift. 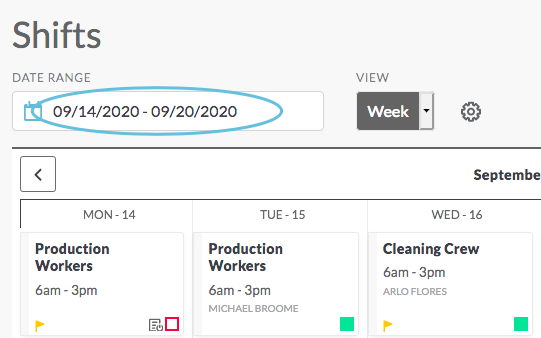 See Viewing the Calendar—Shift details. Note: if you need additional information about the status icons see Viewing the Calendar—Overview.